There are currently 114,570 users on this website. Royal Canadian Mint - The reverse image by artist Jori van der Linde features an engraved outer ring of Roman numerals that captures the look of a classic timepiece. 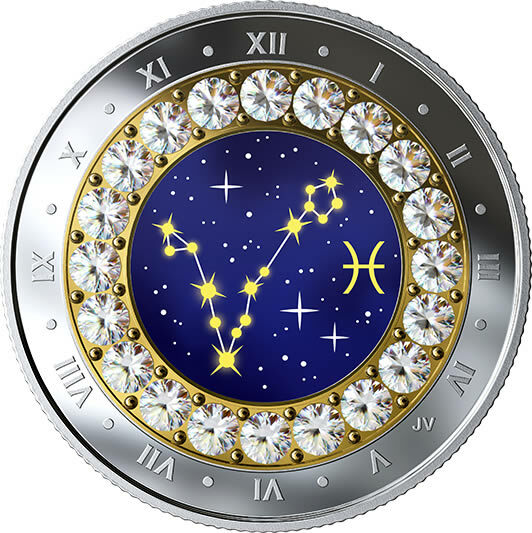 An inner ring of Swarovski® crystals surround a colourful zodiac-themed image, which pairs the constellation and symbol associated with Pisces (February 20-March 20). The obverse features the word "CANADA", the face value "5 DOLLARS", the year "2019" and the effigy of Her Majesty Queen Elizabeth II by Susanna Blunt.